The rectangle, oval, and arc drawn objects can also include optional text notes, as described on this page. 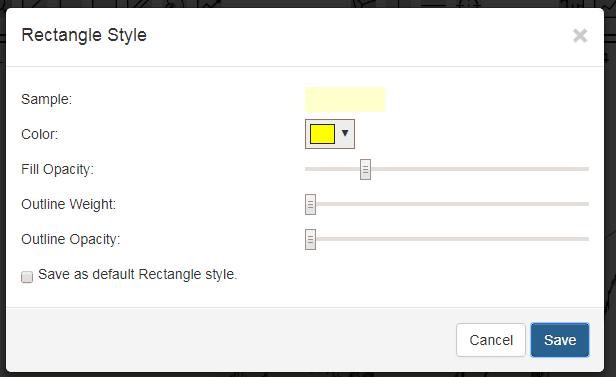 If you enter a text note associated with one of these shapes, you will be presented a dialog box like the one below. There is a checkbox at the bottom of the box that lets you dictate whether you would like your text note to be public or not. From then on, any time you mouse over the highlighted area, it will show the text note. Each of these drawn objects also has its own Style dialog box so you can fine-tune the appearance of the highlights. As you change the slider bars, you will instantly see what the highlight would look like. 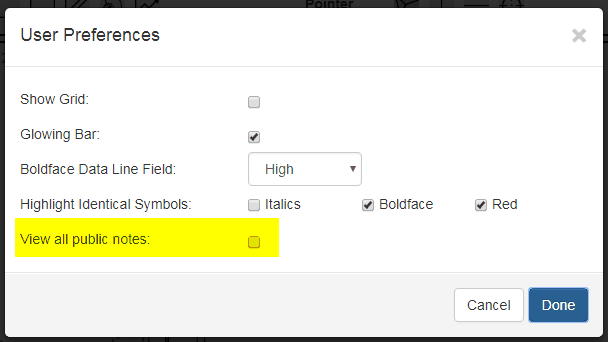 Importantly, you can also make the opacity so low as to be totally invisible. 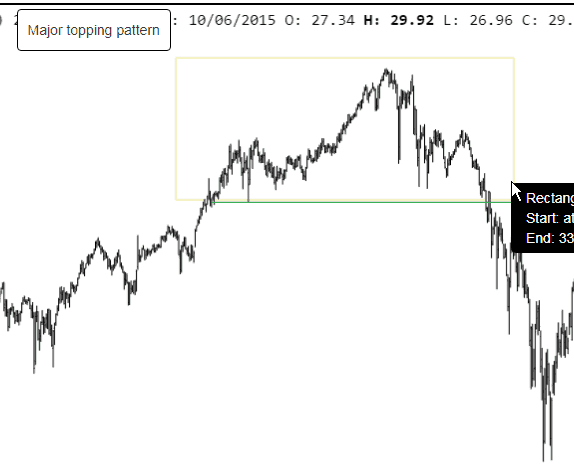 This is useful if you want to put text notes on a chart without having any visible shape showing. The entry of text notes is the “input” that Slopers contribute. The “output” is just as interesting, however, because you can search through the text notes of all Slopers to see the charts they have posted and what their annotations are. 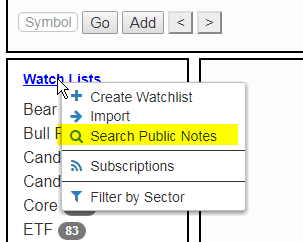 To do this, click on the Watch Lists link and choose Search Public Notes. Type in whatever word or phrase you would like to search and click OK.
Whatever symbols are found will be displayed in alphabetical order in a special new watch list called Search Result. You can go through this watch list just as you would any other. 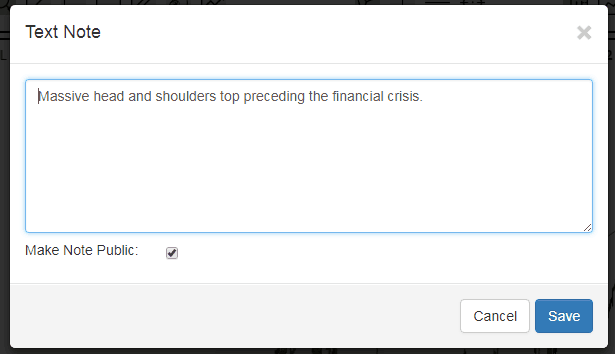 As you look at the symbols, the chart will be displayed with any and all notes from all the users. All the annotated shapes will be displayed as a simple outline (irrespective of the colors and opacities used by the original posters), and you can mouse over any of these areas to see what each note says. 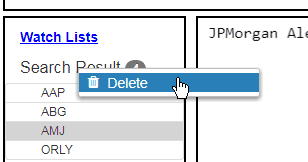 If you want to remove the search result watch list, right click on it and click Delete. Finally, if you’d like to be exposed to all public notes at all times, just go to the Preferences icon (extreme right icon in SlopeCharts) and check the “View all public notes” checkbox. As long as you are in this mode, you’ll see rectangles denoting where anyone has made a note, and you can mouse over those shapes to see what it is they wrote about that portion of the chart.